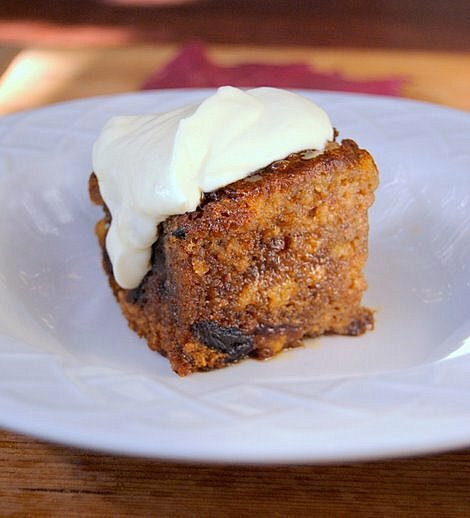 A rich, boozy, classic of Cape cookery that will warm the heart of anyone who appreciates warm, cakey puddings. This recipe was given to me by my late mother-in-law (an excellent baker) some twenty years ago, just after I was married, and I've made it countless times since. It's one of those faultless recipes that should be framed in gold and hung on a wall: it always works, it's fairly easy to make, and everyone loves it - even kids! Look, I'm not advocating that kids binge on the stuff, but don't worry about them eating a small slice. Because the brandy sauce is poured over a very hot cake, much of the alcohol content evaporates. I think Cape Brandy Tart is best with whipped cream, but like all hot cakey puds is also lovely with custard or ice cream, or both. This recipe serves six hungry people, but is easily doubled (and in fact, I recommend you make more, because it reheats very well). If you like, you can add some chopped pecan nuts to the mix, but I prefer this without nuts. Heat the oven to 180ºC. Chop the dates, quite coarsely, using a heavy knife, and place them in a bowl. Sprinkle the bicarbonate of soda over the dates and pour over the boiling water. Set aside to cool slightly. Put the butter and sugar into a large bowl and, using an electric whisk (or a normal whisk and a lot of elbow power), cream together until pale, light and fluffy. Break the egg into one side of the bowl and gradually incorporate it into the butter/sugar mixture. Beat for another minute. Take your time over getting a really light, fluffy mixture. Sift the flour, salt and baking powder into the mixture (hold the sieve up high, so the dry ingredients fall from a height; this helps to aerate the flour). Add the warm date/water mixture and very gently fold everything together. Pour the mixture into a deep 22-cm buttered ceramic or glass pie dish. Bake at 180 ºC for 30-40 minutes, or until the cake is well risen, dark-brown and cooked right through. Ten minutes before the cake is ready, make the syrup. Put the water and brown sugar in a saucepan and bring gently to the boil, stirring frequently to dissolve the sugar crystals. When the syrup is clear, remove from the heat and stir in the brandy, butter and vanilla extract. Remove the cake from the oven. Pour the hot syrup, in batches, over the hot cake, tipping the dish so that it sinks in evenly. The syrup will bubble furiously at the edges of the dish. I just LOVE a lekker brandy tart! This looks heavenly...I can almost smell it.